BONES celebrated its 200th episode last week (for all the coverage on that, check here! ), and the actors got to go a little out of their comfort zone as they played characters who were investigating a murder in the 1950s. When BONES returns next Thursday, Booth and Brennan will be separated — he will be in jail (and not faring well), while Brennan will be free, trying to clear his name. When BONES’ ninth season concluded in May, executive producer Stephen Nathan pointed out, “We’ve never quite been in a situation that has affected these characters this much by external forces.” And when the show returns in September, Booth will be in jail, and Brennan and the rest of the Jeffersonian gang will be struggling to right the wrong of his arrest. BONES is on a mini-hiatus until March 10th (due to its upcoming move back to Mondays), but how about a little tease about what’s to come? When I visited the BONES set last week (to witness the engagement of two BONES fans), I asked series stars David Boreanaz (Booth) and Emily Deschanel (Brennan) to preview what viewers can expect when the show returns next month. 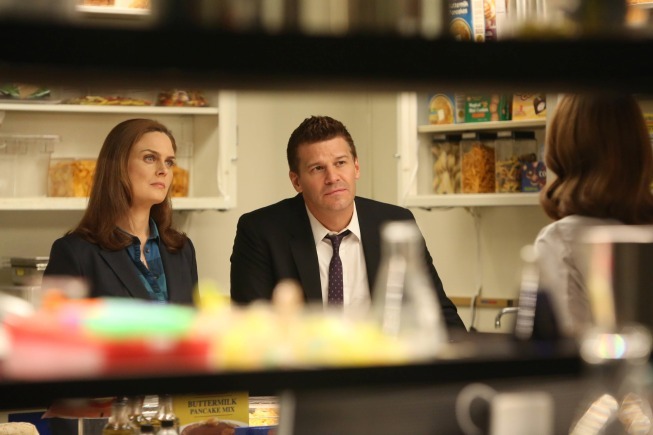 BONES: ‘The Mystery in the Meat’ Photo Preview — Including Brennan’s Bachelorette Shower! Comments Off on BONES: ‘The Mystery in the Meat’ Photo Preview — Including Brennan’s Bachelorette Shower! BONES’ Brennan has never been a traditional woman, so why not have a bachelorette party after she actually tied the knot? Thanks to Angela, Brennan will get a proper bachelorette party — and, as per usual, solve a case. BONES is gearing up to have one of its biggest seasons ever as the show gets ready to marry off Booth and Brennan…and potentially make the move to Friday night. The BONES characters have had a rough go of it lately, but things had been fairly quiet on the Pelant front over the last few months…until this Monday’s season finale.